Total area: 5,299 sq. kms. The first Belgian Jesuit to enter Chotanagpur was Fr Auguste Stockman. He traveled by bullock cart from Midnapur and after a difficult journey of a fortnight reached Chaibasa on November 25, 1868. His work among the Ho tribe did not yield results, so he moved towards Ranchi district in January 1875. Other Belgian Jesuits came to Ranchi in 1877 to act as military chaplains to the troops at Doranda (Ranchi). As the prospects of evangelization among the tribals of Chotanagpur were bright, the first mission stations were opened among the Mundas. However, the real impetus came from Fr Constant Lievens, who arrived at Doranda on March 18, 1885. He is often called the Apostle of Chotanagpur. He left Ranchi on August 26, 1892, a broken man. He died at Leuven in Belgium on November 7, 1893. A century later on November 7, 1993 his mortal remains were re-interred in the Ranchi Cathedral. His Cause for Beatification was officially inaugurated at Moorslede, in the Diocese of Brugge (Belgium) on March 15, 2001. To assist the Missionaries, the Loreto Sisters from Ireland opened a Convent in the red Lodge on Purulia Road, Ranchi, in march 1890. It was here that the Daughters of St. Anne, a Diocesan Congregation, had their beginning in 1897. The Ursuline Sisters of Tildonk, Belgium established themselves in the same compound on January 13, 1903. By 1927 the Ranchi Mission had developed to such an extent that by decree of the Holy See, dated May 25, 1927, it was separated from the Calcutta Archdiocese to form a new Diocese with Ranchi as its Episcopal seat and Msgr. Louis Van Hoeck, sj, as the first bishop. He was succeeded by Rt. Rev. O. Sevrin, sj, in1934, who was pastor for 18 years (1934 - 1952). As the faith spread and took firm root in Chotanagpur, the Catholic Church was being built up and developed, especially through parishes and schools. Soon the rapid growth of the mission made it imperative to call in other labourers, the S.V.D. Fathers, the Australian and American Jesuits. 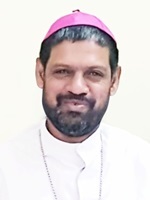 For better pastoral care of the faithful, the vast Archdiocese of Ranchi was divided and on June 14, 1951, the Diocese of Sambalpur gave birth to Rourkela Diocese on July 4, 1979 and Ambikapur became a separate diocese on December 14, 1977. On September 19, 1953, the Diocese of Ranchi was raised to the status of an Archdiocese with Sambalpur and Cuttack as its suffargans. On July 2, 1962, the Diocese of Jamshedpur was created. Then in 1968, the Diocese of Patna and Bhagalpur and the Prefecture of Balasore were made suffragans of Ranchi Archdiocese. Again on June 5, 1971 the Diocese of Daltonganj, comprising the civil districts of Hazaribagh (which itself became a diocese on May 12, 1995), and Palamau was carved out of the Archdiocese of Ranchi. In 1980, Muzaffarpur Diocese was formed from a part of Patna Diocese and made suffragan of Ranchi. The Andamans and Nicobar Islands, became part of Ranchi in 1947, and were since 1966 under the care of the Pilar Fathers, and became a new Diocese on June 26, 1984. On July 1, 1993, two new Dioceses, Gumla and Simdega, were established with territories taken from the Ranchi Archdiocese. On May 12, 1995 the new Diocese of Khunti was established with territories taken from the Archdiocese of Ranchi. It comprises the whole Khunti civil Sub-division. In 1998 two more new Dioceses were created, North of the Ganges, and made suffragans of Ranchi, Bettiah and Purnea. Thus the original Ranchi Diocese divided into 14 Dioceses including the present Archdiocese of Ranchi. On March 16,1999 the Ranchi Ecclesiastical Province was bifurcated in anticipation of the creation of Jharkhand. Patna, Capital of Bihar, became an Archdiocese with four suffragans: Bettiah, Bhagalpur, Muzaffarpur and Purnea.